Rosetta landed near a 430-foot (130-meter) wide pit nicknamed “Deir el-Medina” in a pitted region of the comet that is spewing dust into space. Known as the Ma’at region, this area has active pits wider than 330 feet (100 meters) with depths ranging from 160 to 200 feet (50 to 60 meters). Along the walls of the pits are lumpy structures approximately 3 feet (1 meter) wide, which may be leftovers of the original fragments or “cometesimals” that came together to form the comet in the Solar System’s early years. Geoff Yoder, the acting associate administrator for NASA’s Science Mission Directorate, praised the Rosetta mission as a hallmark of mission design, execution, and international cooperation. Launched in 2004, Rosetta arrived at its destination on Aug. 6, 2014, and entered orbit around the comet as it headed toward the Sun for its 2015 perihelion. It was the first spacecraft ever to rendezvous with a comet and enter orbit around it, observing its changes as it headed toward the Sun. Rosetta experienced intense solar radiation and as it receding from the Sun during the last year of the mission. On board Rosetta were 11 science instruments, including some constructed with assistance from NASA. These included the Alice spectrograph, the Microwave Instrument for Rosetta Orbiter (MIRO), the Ion and Electronic Sensor (IES), and the Double Focusing Mass Spectrometer (DFMS) electronics package for the Rosetta Orbiter Spectrometer for Ion Neutral Analysis (ROSINA). Of these, MIRO, IES, and Alice are NASA instruments. NASA Jet Propulsion Laboratory (JPL) Rosetta scientist Bonnie Buratti emphasized that all three collected data until the last possible moment. Throughout the mission, MIRO studied the movement of gas and dust as they left the comet’s nucleus to form its coma and tail, regularly measuring the surface temperature of both, providing valuable insight of the comet’s evolution as it approached the Sun. MIRO was also capable of studying water, carbon monoxide, methanol, and ammonia. IES analyzed the plasma atmosphere of Comet 67P as well as the charged particles comprising the solar wind, focusing on the interaction between the two. An ultraviolet spectrometer, Alice studied gases in the coma and tail; measured the rate at which the comet produces water, carbon dioxide, and carbon monoxide, and gauged argon levels. This information informs scientists of the nucleus’s composition and helps scientists determine the Solar System’s temperature 4.6 billion years ago when the comet formed. MIRO was built by JPL, home of its principal investigator Mark Hofstadter. IES and Alice were designed by the Southwest Research Institute, home of their principal investigators, James Burch and Alan Stern, respectively. NASA also provided some of the electronics for ROSINA’s Double Focusing Mass Spectrometer as well as software that planned autonomous science operations for the mission. Throughout the mission, ESA’s Ground Station Network used NASA’s Deep Space Network for navigation and tracking. American scientists also took part in collaboration and partnership on non-US instruments. Because comets are composed of pristine material left over from the time the Solar System formed, observing them up close can yield important data about the Solar System’s origin and evolution. Such observation could also shed light on the role comets played in the formation of the Solar System’s planets and on whether they brought water to Earth. Three months after Rosetta’s arrival, it deployed the Philae lander onto Comet 67P’s surface, marking the first-ever soft landing of a spacecraft on a comet. 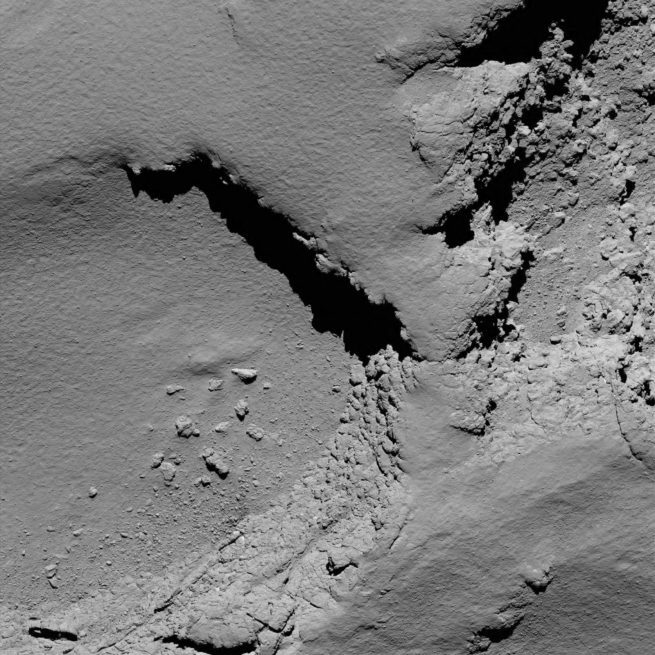 When Philae’s legs failed to anchor it to the comet’s surface as planned, the lander bounced several times before finally touching down. Philae was able to complete 80 percent of its first science goals and send the data back to Earth before falling silent once its battery lost power. Uncertain of where Philae had landed, mission scientists hoped it would revive as the comet headed toward the Sun, powering its solar panels and recharging its battery. 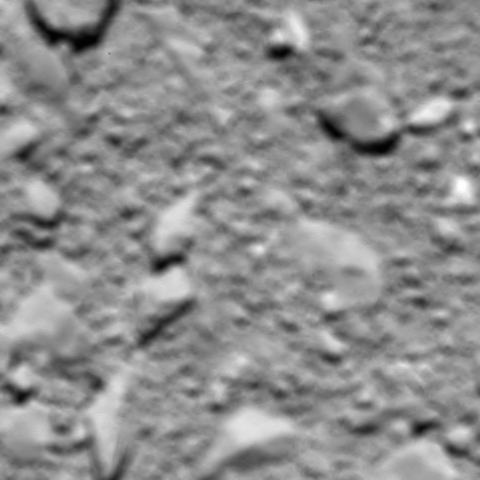 However, the lander was heard from only twice: in June and July of 2015. As Comet 67P headed closer to the Sun, its outburst activity increased, forcing Rosetta to retreat to a more distant orbit that put it out of range for communication with Philae. Less than a month before the scheduled impact ending the mission, while in a close orbit around the comet, Rosetta finally discovered and imaged Philae, revealing the lander lying on its side with a leg stuck in a crevice. Its solar panels were in shadow, explaining why they had been unable to power its battery. ESA chose to end the mission because Comet 67P is receding from the Sun, resulting in insufficient solar power for the spacecraft and its instruments to function. Mission scientists hoped to land Rosetta within 3.1 miles (5 kilometers) of Philae, reuniting the two forever. On Sept. 24, Rosetta moved into a new orbit to prepare for descent. Five days later, it set itself on a collision course with the comet it had orbited for more than two years. Collecting its last scientific data, the orbiter began to free fall on Sept. 29 upon reaching 11.8 miles (19 kilometers) above Comet 67P’s surface. 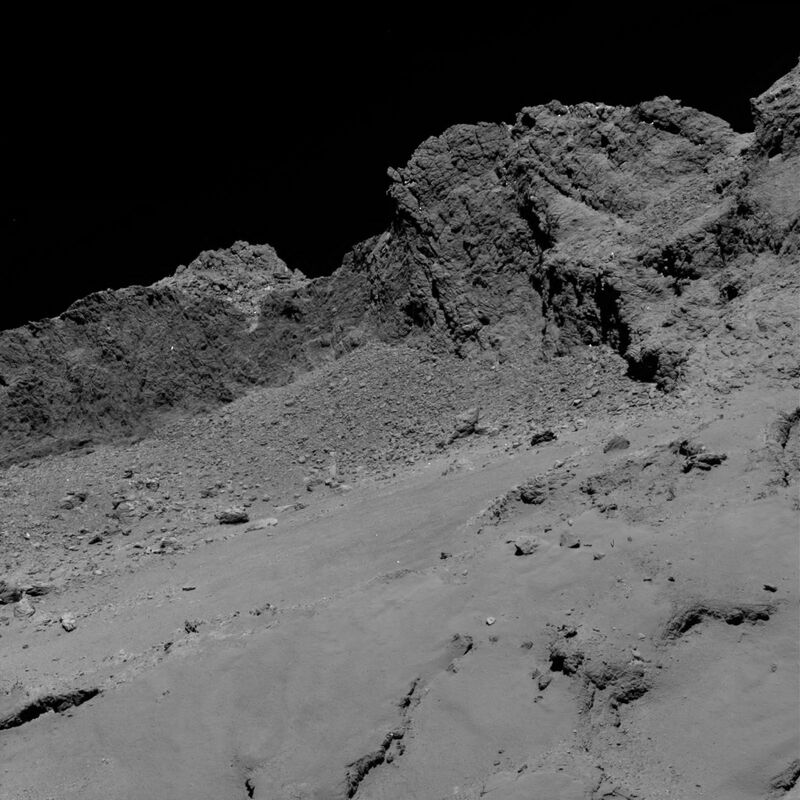 Rosetta sent its final measurements of the comet’s gas and dust along with high-resolution images of its nucleus back to Earth during the last hours before impact. Art Chmielewski of JPL, project manager of the U.S. Rosetta Project, acknowledged scientists’ emotions upon receiving Rosetta’s final transmission. “But whatever melancholy we will be experiencing will be more than made up for in the elation that we will feel to have been part of this truly historic mission of exploration,” Chmielewski said. However, it should be remembered that NASA basically did the same thing in 2002 with the NEAR probe soft landing on the asteroid Eros. I suspect that is where the Europeans got the idea. Similar mission, but this was a comet in a highly eccentric orbit, so rendezvous is more complicated. In addition, the makeup of comets and asteroids are different, so the instruments taken on each mission are different.